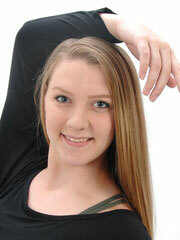 Dayna Eberhard grew up in Acworth, GA and has been dancing since the age of 9. She currently dances with the Advanced Company at Bravo Dance Center in Acworth. Dayna has enjoyed participating in many annual competitions and showcases including Jazz On Tap, Balletfest, Jump, and 24 Seven. After participating in the Fusion Convention 2015, she was selected as one of the 2016 Senior Fusion Apprentices and was given the opportunity to assist with classes and perform at Nationals. Her choreography has received superior scores in competitions. Dayna has performed several times for the Atlanta Hawks games and has danced for various community events, including the Teal Takeover. She was fortunate enough to be cast for the upcoming movie, Of Ancient Days. Since 2014, Dayna has performed with Bravo Dance Center’s annual Holiday Express performance in Marietta, GA at the Strand Theater. As a performer and student choreographer, Dayna hopes to expand her knowledge through experience and training in the upcoming years. Her college plans include the study of Kinesiology and Dance in hopes of connecting art with science. Dayna has a passion for creating and choreographing and always looks forward to new challenges! Major Steve Kish joined the Marietta Police Department in 1993, and currently commands Zone 4, Day Watch, School Resource Officers, Community Response Unit, Traffic Enforcement Unit and Internal Affairs. Major Kish has served as a School Resource Officer, Bike Patrol Officer, Community Policing Officer, Honor Guard Officer and Sergeant, Gang Task Force Sergeant, SRT Sergeant, Community Outreach Sergeant, SWAT Lieutenant, Community Outreach/STEP Lieutenant, Office of Professional Standards Lieutenant and Internal Affairs Investigator. Major Kish graduated from the PERF Senior Management Institute for Police, 244th FBI National Academy, is a University of Georgia Carl Vinson Institute of Government graduate and a Dale Carnegie graduate. Major Kish holds certifications in law enforcement at the Intermediate, Advanced, Supervisor and Management levels and is a two time recipient of the Medal of Merit from the Marietta Police Department. 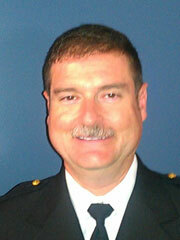 Major Kish holds a Master of Public Administration degree from Columbus State University, a Bachelor of Science in Sociology degree from Kennesaw State University and an Associate of Applied Science in Law Enforcement degree from Chattahoochee Technical College. Major Kish received an Honorable discharge from the United States Army Reserve and is a veteran of Desert Shield/Storm. Major Kish is a member of the Georgia Police Accreditation Coalition, a board member of the Georgia Internal Affairs Investigators Association, the president of the Cobb County Law Enforcement Association, a member of the Georgia FBI National Academy Associates and various other law enforcement associations. Major Kish is married to his lovely and patient wife of 23 years, Stacey and they have three awesome children together, Kaitlyn, Emaleigh and Stevie.